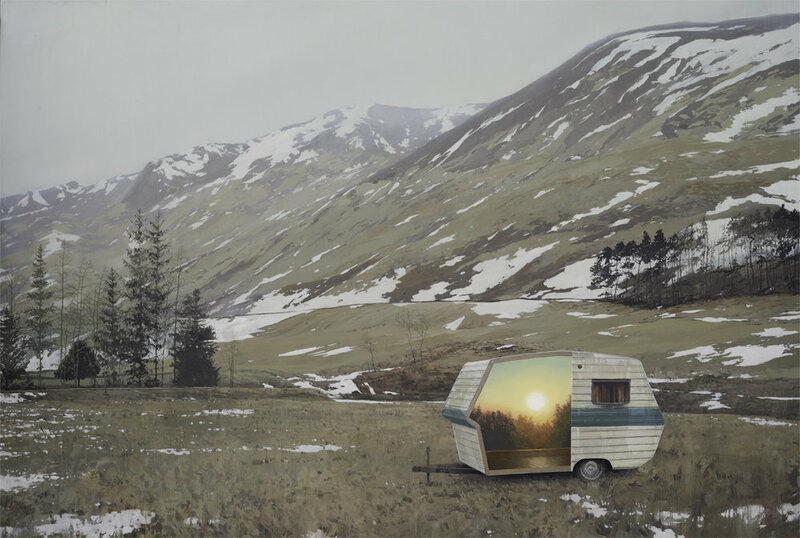 Andrew Mcintosh’s paintings bring forth an intense, atmospheric landscapes complete with a quiet sense of melancholy. In his series Abandoned Dollhouses, his secluded, scenic views are often filled with barren trees and thick fog, while the only signs of human life have long been abandoned. However, there is an abnormal source of light radiating from within these structures. Hues of oranges and reds are held inside each deserted trailer and house, producing the only warm tones in the painting. The sun present inside these structures harshly contrasts the cold palette that engulfs everything else in the composition. It is as if this beacon of fiery light is trying to escape its confines and pierce through the dense fog, penetrating the moody atmosphere. Originally from the highlands of Scotland, Mcintosh currently lives and works in London and is represented by James Freeman Gallery as well as Bo.Lee Gallery.